Here they are. Very chocolaty and really sticky but, believe it or not, "low-fat" chocolate brownies. 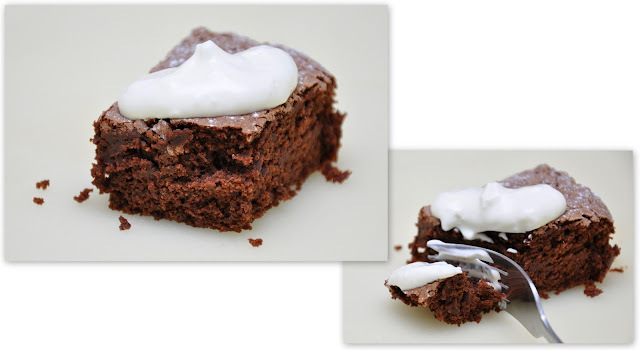 I posted this unbelievable mayonnaise chocolate brownies recipe before but here is a slightly amended version after trying it several times. These chocolate brownies can be made in a round tin and turned out as a cake. Meanwhile, lightly oil and base-line a 19cm square cake tin that is 5cm deep. Combine the flour, cocoa and bicarbonate of soda (or baking powder which I prefer). Using a wooden spoon, stir both the sugars into the cooled chocolate with vanilla, milk and tiny drop of lemon juice. Stir in 1 tbsp warm water. Break and beat in the egg, then stir in the mayonnaise just until smooth and glossy. Sift over the flour and cocoa mix, then gently fold in with a spatula without overmixing.